The idea of combining both sweet and spicy tastes in a dish was not new to me. Many of my Chinese recipes used this fantastic combination too. But for making desserts, it seems to be another horizon for me to explore. When I flipped through the Good Food magazine, the recipe of Pineapple with chilli syrup really got my eyes and won my heart. Without a minute hesitation, I went out to source a decent and sweet pineapple. I found that Bethonga gold pineapples won’t let me down for once. They give a stronger flavour with less acidic than other regular pineapple. Some people might sense a bit itching feel on tongue when eating fresh pineapples, especially the regular type of pineapples, that caused by the bromelain content. It might not be as serious as allergy, just a mild uncomfortable feeling on the surface of their tongues. That’s why hubby dislikes eating regular pineapples. I learnt a small trick from my mother-in-law to remove or reduce the unpleasant irritations. Simply soak the pineapple slices in salted water for a short while. The small amount of salt would help decrease the unpleasant substance, also elevate the flavour of the fruit. Stir sugar and ½ cup water in a small pan on low heat until sugar dissolves. Increase heat to medium and boil for 7 mins, until syrupy. Remove from heat. Stir in chilli and set aside. Cut pineapple into four 2-3cm-thick slices. Using an apple corer or cookie cutter, remove core from pineapple slices. Preheat a chargrill or barbecue on high. (I used a grill pan to fry the pineapple slices and made the grill marks.) Cook pineapple for 3-4 mins each side, until golden. 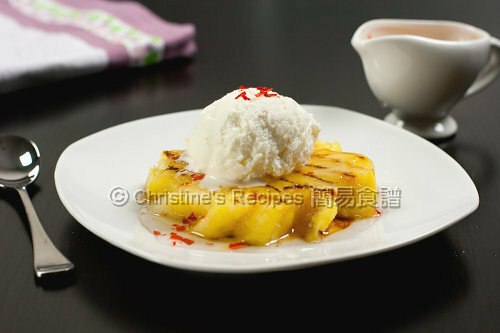 Divide pineapple slices between plates, top with ice-cream and drizzle over chilli syrup. Scatter over mint, dust with icing sugar and serve. Christine! Thanks for the tip - sometimes I get "cuts" on my tongue from eating pineapples so I dont do it so often. But I do love them - especially plain, with some good quality salt. 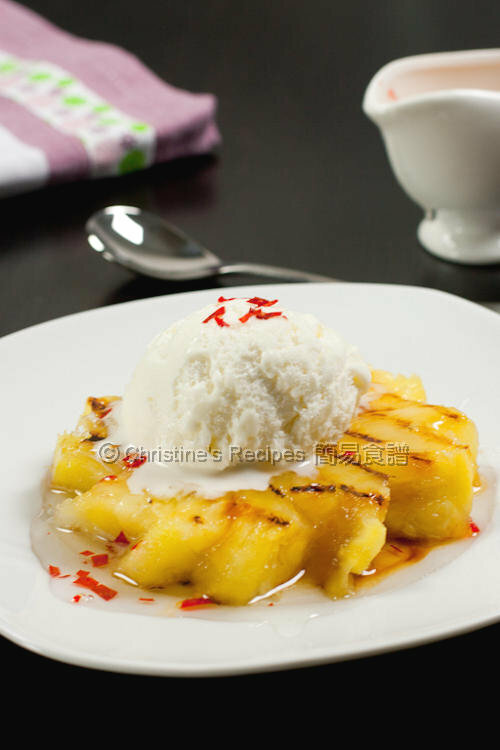 I also love the idea of roasting pineapples - I must try it with Chili one day...Well done. I love pineapple but only will consume those very ripe pineapple cos afraid might "cut" my tongue :P. This is an unusual combination, ice cream with spicy sauce, so serious about the taste. I know what you mean by that uncomfortable pineapple 'tongue'. It's probably why I use to stick to tinned pineapples. But I found Bethonga to be pretty good. Nice dessert and refreshing! I would cook the pineapple a little before eating. No cuts on the tongue. My mum likes to add salt to her pineapples, but I don't, I always thought it's weird. I guess there's a reason for it! Very creative dish! Delicious - refreshing & spicy! I am a little addicted to the Vietnamese way of eating fresh pineapple with chilli salt (or anything with chilli salt) so I'm sure to enjoy this too! This is definitely something new for me as well in the dessert area :) but it looks delicious. This sweet and spicy combination sounds so interesting! A great discovery for me too! What an unique pineapple and ice cream treat! Love the chilli syrup. I never tried a treat like that! 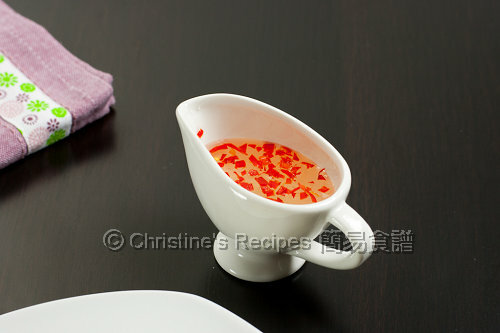 And that chili syrup over ice-cream sounds brilliant! I love the beautiful grill marks on the pineapple. Wish I could savour your dessert now. Your dessert is rather unique! Sweet, sour and spicy! Would love to try it!